Happy Monday! I hope you all had fantastic weekends. 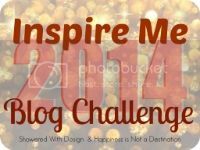 I'm pleased (and a little saddened) to say this is the last week of the Inspire Me 2014 challenge. It's been a great month and I've loved all the "out of my comfort zone" posts that I have written for this challenge. It's not over yet though! Monday January 27: The littlest thing can set us off. Right about a pet peeve and try to get creative! I hate to say it but I have many pet peeves. We all do, I know, but depending on what it is, I get a little too impatient or annoyed by it and I don't like that. I've been finding that as I get older, things make me a little more antsy faster. If I had a penny for every time Brian said "you're so OCD" last year, I'd be beyond rich! My mom says that I don't necessarily have OCD, I just like things neat and looking good. In other words, I have high expectations than some but not as bad as others. I realize the things I do, whether it be mumbling something I dislike under my breath when in public or doing something around the house. I've been proud of myself because I've been able to back off a little with how "perfect" I need everything and I don't let things in public get to me as much. Instead of just writing one thing I've decided to write a few! In the grocery store - I've started telling my parents that as they processed out of an isle they need to look both ways like they are driving a car. I've never driven a car but going to the store on a busy day pretty much sums up the experience for me. There seems to be no respectable ethic anymore. Weaving in and out of people, zooming by with a cart, not looking up long enough to realize it might be best to stop and wait a minute. Gosh, the list could go on and on! My dad dropped me off to go get milk yesterday. It took more time for me to walk through the store to get the milk than it did to wait in line behind 3 different people. No excuse mes, flying in and out of isles...I wish I could of been a fly instead! Cleaning - I've mentioned before that I love organization and cleanliness. When having a man in the house, it makes this process every harder. One of my biggest pet peeves is when glasses that contained a drink or food bowls are sitting in different spots not being cleaned. I dont really understand why it's so difficult to bring things into the kitchen. I personally don't mind cleaning it all but at least bring it to me. And then there are the clothes and papers and little other things. The other day my dad and I came home to one of the dining room chairs being out, the table was a mess because the dog was able to jump onto it from the pulled out chair, and the laptop cord was still plugged in. It takes 5 minutes to clean. Clothes lay on a little stool I have in my room for days. The laundry is right downstairs and my mom is more than happy to do it all. It's very difficult to have to re-clean a room after I already cleaned it two hours before. Always say thank you - I'm the type of person that always holds the door open for others. I hate when I"m about to go out a door behind someone and they let the door just shut in my face. The thought for others isn't the main goal anymore I guess. As I hold the door I always see if the person says thank you. I'm taking a minute of my time to do a good deed for them, the least they can do is acknowledge that. Reality? Most don't. They walk out without a care in the world. My dad told me once that he says your welcome either way. Even if they dont say thank you, you need to be the bigger person. I've done it many times that way and usually the people just look at me. Lisa and I would love for you to link up with us! I love when my kitchen is clean! it makes the whole house seem cleaner! !